Mass of the Saints is a new contemporary setting of the Mass texts, fusing Gregorian tradition with contemporary sensibilities. 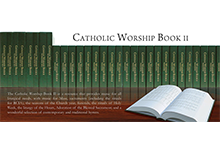 It equips parishes and schools with a core repertoire of prayerful, memorable, contemporary settings of those songs of the Mass that are most frequently sung - the Kyrie (Penitential Rite), Gloria(Glory to God), Alleluia (Gospel Acclamation), Sanctus (Holy, Holy, Holy), Memorial Acclamations, Great Amen, and Agnus Dei (Lamb of God). The melodies have been developed from a contemporary interpretation of some of the motifs from Missa De Angelis and the Requiem Alleluia. You can purchase Mass of the Saints products here.